A tabletop Christmas tree is an adorable greenery adornment that you can place on large farm tables, side tables and other locales throughout your home or business. Think of these as holiday topiaries that you can place and fit into almost any area of your Christmas décor. At Christmas, these festive displays can be decorated in a theme that fits into the rest of your Christmas décor theme. Small gumdrop sized Christmas ornaments look cute, placed on the tree along with a bow topper. Some people place a tree skirt or burlap sack around them and others leave them bare for a natural look. You can usually spot these on festive dinner tables across the southeast. Longer tables look great with two, perfectly placed near each ending point of your table centerpiece. 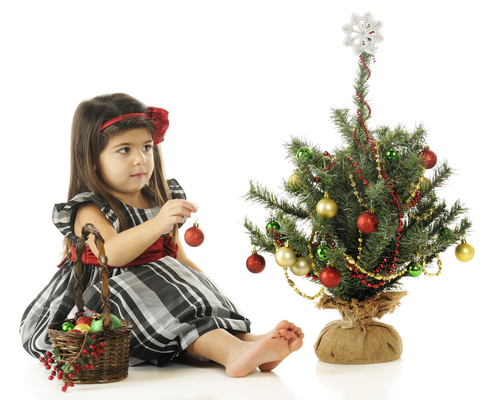 Children love table top Christmas trees and decorating their own tree to put in their room. It gives them a sense of independence and wonder as they find ornaments and beaded garland to place on their tabletop Christmas tree. They fit perfectly on a child’s nightstand or bedside table. Some give small tabletop Christmas trees as gifts, during the holidays. Also, organizations and schools sell tabletop Christmas trees to raise money around Thanksgiving and Christmas for their cause. We would love to discuss the fundraising opportunities that you can do with these affordable trees. We mainly sell Fraser fir tabletop Christmas trees because even the smaller Fraser fir’s branches and needles can hold ornaments and other decorations. These are grown and pruned and typically cut when they are a few feet in height. Other Christmas tree types can be cut small and used as table top Christmas trees, but their branches and needles are not quite as strong as the sturdy Fraser fir. However, we do sell White Pine and Blue Spruce trees as well. We ship and sell live tabletop Christmas trees all across the United States. Contact us to order your small tabletop Christmas trees this year. Our trees are grown in NC, VA, and WV and we ship wholesale Christmas trees throughout the country every holiday season. This year, 2015, we were awarded the Co-Reserve Champion Award by the National Christmas Tree Association. We can ship bulk orders for businesses, tree lots and other organizations that wish to buy our trees in bulk.